Attention, easily brainwashed citizens of Earth! 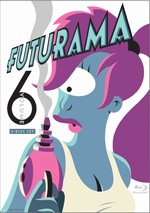 You are now under the control of Futurama Volume 8: the highly animated sci-fi comedy from The Simpsons creator Matt Groening. Packed with mind-altering, brain-exploding extras not shown on TV, this outrageous collection includes 13 mesmerizing episodes featuring maniac street racers, robot grave robbers, and nerve-wracking nose transplants. You'll watch, you'll laugh, you'll obey. The Hypnotoad commands it! Back in 2003, Futurama got cancelled for the first time. In 2007, it made a comeback via four direct-to-video films and then returned to episodic TV on Comedy Central in 2010. 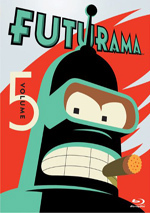 Futurama managed four 13-episode seasons before it again got the axe. Will it return? Time will tell, but for now, this “Volume 8” package stands as the series’ finale. We get those 13 programs in this two-disc set. I’ll look at the shows in the order presented here. The plot synopses come straight from the discs’ menus. Forty Percent Leadbelly (aired June 20, 2013): “At a maximum security prison, Bender meets a famous folk singer and attempts to make a copy of his precious guitar.” Bender-based episodes usually offer some of the series’ top material, but “Leadbelly” disappoints. The basic folk-singing theme just doesn’t work and it fails to find a lot of good opportunities for comedy. This doesn’t make it a bad show, and the last act helps redeem it, but overall it’s lackluster. 2-D Blacktop (aired July 3, 2013): “Professor Farnsworth joins a gang of street-racing punks.” Despite the focus on the Professor – who’s not a favorite character of mine – “Blacktop” manages reasonable entertainment. While its race-movie spoof isn’t great, it still manages laughs, and when we hit its third act twist, it opens up well. This isn’t a great show, but I like it. T: The Terrestrial (aired June 19, 2013): “After being marooned on a distant planet, Fry is befriended by a young monster.” Though its ET parody bbecomes more specific than I’d like, “Terrestrial” still entertains. It’s the strongest episode so far this year, as it musters a good story and mixes in clever gags. Any show with Nixon’s head boasts an advantage and this one works well. Fry and Leela’s Big Fling (aired June 19, 2013): “Fry and Leela’s romantic vacation goes disturbingly wrong.” With “Fling”, we get a fairly spotty episode. The Planet of the Apes parts do pretty well for themselves, but the main narrative with Fry and Leela lacks much zing. “Fling” still offers decent amusement, but it becomes a step back after “Terrestrial”. The Inhuman Torch (aired July 10, 2013): “Bender becomes a famous firefighter, but the crew suspects him of arson.” Our second Bender-focused show works better than the first, though I still wouldn’t view it as particularly great. Actually, unlike its predecessors, “Torch” loses steam as it goes; the first half fares better than the second. Despite that flaw, the show gives us reasonable material for the most part. Saturday Morning Fun Pit (aired July 17, 2013): “The gang stars in a trio of craptastic morning cartoons.” Unlike the prior episodes, this one splits into three separate parts, each of which spoofs different old TV animated series. The variety adds spice to the season, as it offers a nice mix of parodies. Calculon 2.0 (aired July 24, 2013): “Bender goes grave robbing to bring his favorite actor back to life.” This show follows up on Volume 7’s “Thief of Baghead” and provides a fun experience. It becomes one of the year’s better shows, even if it doesn’t integrate the usually delightful Robot Devil as well as it could. Assie Come Home (aired Jule 31, 2013): “Bender searches the universe for his missing shiny metal rear end.” “Home” comes with a genuinely idiotic concept but nonetheless turns into one of the year’s better episodes. It milks each of its settings/situations for great laughs and becomes a consistent delight. Leela and the Genestalk (aired August 7, 2013): “After a rare condition causes Leela to grow tentacles, she stumbles upon a secret genetic engineering facility.” After the winning “Home”, the season stumbles with the lackluster “Genestalk”. Though it starts well with a fun scene at a country bar, once it launches into its Jack and the Beanstalk spoof, it falters. Though we still get a few laughs, these don’t sustain the show well. Game of Tones (aired August 14, 2013): “The crew journeys into Fry’s dreams to seek the meaning of a mysterious alien melody.” After a great episode and a mediocre one, “Tones” falls somewhere between those poles. It comes with fun twists and even a little emotion as Fry revisits his past. While not a terrific show, it mostly works. Murder on the Planet Express (aired August 21, 2013): “The crew becomes trapped aboard ship with a horrific alien creature.” After the emotion of “Tones”, “Murder” goes with a more freewheeling sense of fun. It largely spoofs Alien and delivers some good antics along the way to become a lively and enjoyable show. Stench and Stenchibility (aired August 28, 2013): “Dr. Zoidberg meets the love of his life while Bender squares off in a deadly tap dancing competition.” Zoidberg-based episodes usually falter, but this one does pretty well for itself. It goes down a fairly predictable path but still has some charm, and the Bender segments add zest. Meanwhile (aired September 4, 2013): “Fry asks Leela to marry him, and they face their destiny together as the Professor’s latest invention alters the fabric of time.” Only time will tell if “Meanwhile” finishes Futurama. If it does, the series goes out on a positive note, as the episode delivers humor and warmth to create a moving, satisfying finale. 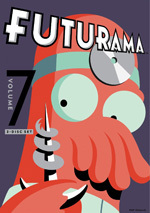 Futurama appears in an aspect ratio of approximately 1.78:1 on these Blu-ray Discs. The visuals looked excellent. From start to finish, sharpness seemed immaculate. The episodes displayed terrific clarity and accuracy, without any signs of softness. No issues with jagged edges or shimmering occurred, and the shows lacked haloes. Print flaws also failed to mar the programs. With a variety of exotic settings, Futuama delivered a broad range of colors. These consistently looked peppy and bright, with good clarity and reproduction. Blacks seemed dark and deep, while shadows came across as smooth and clear. Everything here looked great. Though not as strong, the series’ DTS-HD MA 5.1 audio seemed good. The soundscapes didn’t dazzle but they added some zoom and involvement along the way. Ships moved around the room well and various action scenes contributed reasonable involvement. This ended up as a package with generally lively and involving soundfields. Audio quality always satisfied. Music was full and dynamic, while speech seemed concise and natural, without edginess or other concerns. Effects came across as accurate and full; they showed clean highs and warm lows. I felt the material deserved a “B+”. Fans who’ve seen prior Futurama sets will know what to expect from V8’s extras, and all 13 episodes include audio commentaries. For these, executive producers Matt Groening and David X. Cohen, supervising director Peter Avanzino, producer Claudia Katz and actor Billy West chat on all of them. Producer Lee Supercinski also appears on all except “Inhuman Torch”. In addition, we hear from co-executive producers Patric M. Varrone (1, 5, 6, 7, 8, 9, 13), Dan Vebber (5) and Josh Weinstein (2, 3, 6), directors Stephen Sandoval (1, 7), Raymie Muzquiz (2, 8). Lance Kramer (3, 9), Edmund Fong (4, 10), Frank Marino (5, 11), Crystal Chesney-Thompson (6, 12), writers Eric Rogers (2, 4), Eric Horsted (12) and Lew Morton (11, 13) and actors Lauren Tom (2, 3, 4, 11, 12, 13), John DiMaggio (1, 5, 10, 11, 12, 13), Phil LaMarr (1, 5), Maurice LaMarche (7, 8, 13), and Tress MacNeille (9, 10, 12). We also get a “Bonus Animator Commentary” for “Game of Tones”. It features Avanzino, Fong, Katz, Kramer, assistant director Darin McGowan, and background designers Jeff Mertz and Alen Esmaelian. These commentaries follow the template set in prior volumes. Cohen acts as the most prominent participant, mainly because he likes to explain references and scientific theories. The actors play a pretty active role as well and lend a party vibe to the proceedings. That ensures that they remain entertaining even if they occasionally lack great informational value. The commentaries crank along at a nice pace and keep us with them. We get a reasonable amount of info about the episodes in these enjoyable tracks. As for the “Bonus Animator Commentary”, it seems less fun than the others – inevitably, I suspect – but it still delivers some useful material. It digs into technical topics in a positive way and becomes a worthwhile listen. Disc Two includes a collection of Deleted Scenes with a total of 16 minutes, six seconds. Most show animatics, but final animation appears for a few. We get deleted scenes for 11 of the 13 shows: “Forty Percent Leadbelly” (two scenes), “T: The Terrestrial” (one), “Fly and Leela’s Big Fling” (two), “Inhuman Torch” (one), “Saturday Morning Fun Pit” (two), “Calculon 2.0) (one), “Assie Come Home” (three), “Leela and the Genestalk” (two), “Game of Tones” (four), “Stench and Stenchability” (four) and “Meanwhile” (three). As usual, the clips tend to add to existing scenes, so you’re not going to find much truly unique content here. “Meanwhile” throws out some interesting alternate concepts, though, and a few other unusual developments accompany the shows. In any case, they usually seem pretty entertaining, so they’re worth a look. Two featurettes finish the set. Futurama University goes for 24 minutes, 27 seconds and offers notes from Katz, Avanzino, character designers Karapet Keroglyan, Shannon O’Connor, director of computer graphics Scott Vanzo, color supervisor Samantha Harrison, color keys Tim Brock and Bari Kumar, digital BG painter Alex Chao, lead 3D artist Eric Whited, and 3D animators Don Kim and B. Shimbe Shim. The three segments of “University” examine character design, color and 3D modeling. It looks over these subjects with good detail, especially when it looks at the development of specific episode components. “University” delivers a nice overview. Finally, Inside Futurama: The Writers’ Room of Tomorrow lasts 13 minutes, 25 seconds and comes hosted by Patric Varrone. He takes us on a tour of the room and shows us details about the location in which the series got written; Cohen shows up along the way as well. While not as informative as “University”, it offers some useful material. 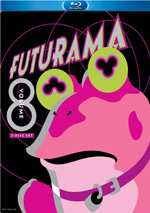 It remains to be seen if Futurama will return, but if this “Volume 8” set marks its conclusion, the series goes out in a satisfying manner. While inconsistent, the episodes amuse most of the time and we get a few truly great programs along the way. The Blu-rays offers excellent visuals along with very good audio and some useful bonus materials. This becomes an enjoyable collection of programs.